up to 53.90 cu. 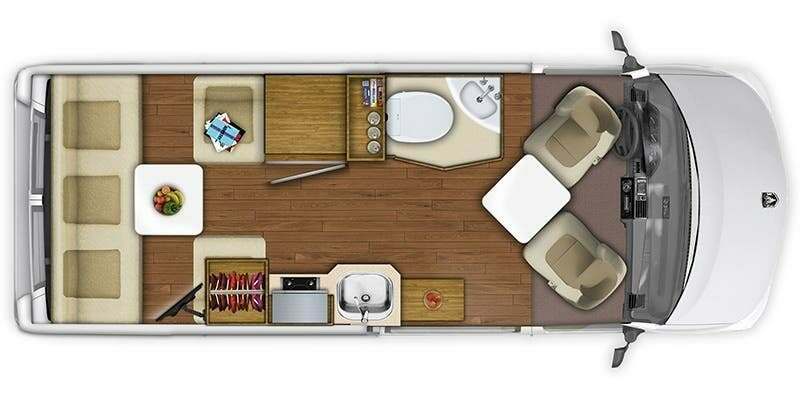 ft.
Six year unlimited mileage/km, Peace of Mind motorhome warranty, covering the manufacture of the motorhome, appliances, electronics, plumbing and EcoTrek™ batteries. Original manufactures warranty on all appliances will be applied first. The warranty on this unit covers personal use of the RV only. Rental or commercial use of RV voids the warranty on the unit. Warranty excludes the complete chassis and AGM batteries which have a normal one year manufacturer’s warranty. 5-year/100,000-mile or 100,000-kilometer Powertrain Limited Warranty covering the cost of repairs on all covered powertrain components – engine, transmission and drive system for most new Ram vehicles. 3-year/36,000-mile or 60,000 kilometer Limited Warranty, provides bumper-to-bumper coverage of your vehicle, from the body to the electrical system. Refer to chassis manufactures’ website for complete details. Allowance for weight of occupants, water, propane and cargo. Reduce by weight of optional equipment. GCWR includes total weight of vehicle, trailer, equipment, fuel, water, propane, cargo, driver and passengers. Maximum towable weight with driver and fuel only. This weight reduced by weight of optional equipment, water, propane, cargo and/or passengers. A weight distributing hitch is required for tongue weights over 200 Kg/400 lbs.